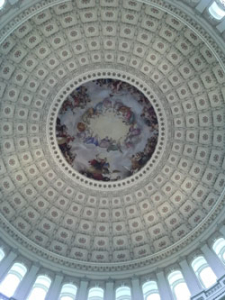 The tour of our nation’s Capitol building was outstanding! The students were wonderful and our tour guide complimented them on their attentiveness and thoughtful questions. Everyone was so happy to see each other after the month apart. Lots of smiles, hugs, and catching-up! Our mentors and volunteers did a great job keeping track of everyone and keeping us on schedule since we had such a busy agenda. I think I speak for all of us that we were awed by the beauty of the architecture, the paintings, the sculptures, and the sheer magnitude of the history that exists in this special heart of our government. We registered our academy for special educational opportunities and we were invited back to see the House and Senate Galleries in action any day of the work week that we can arrange in the future. We were also given special educational booklets at the end of the tour experience that offered even more information and special facts. 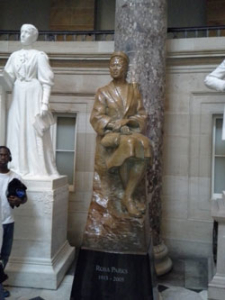 For instance, we saw how the statue of Rosa Parks was place directly across the room from Jefferson Davis as a special statement to how she bravely stared down injustices with quiet resolve and determination. I will send photos separately since some of you can’t receive them and I wanted to make sure you have this report without delay. 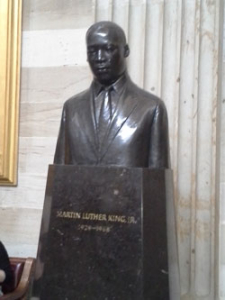 We ate a delicious lunch in the Emancipation Hall restaurant. Mr. Fareed Mostoufi and Mr. Anthony Jackson presented great information about joining the Arena Stage VOICES OF NOW Youth Empowerment Ensemble. We had such an amazing performance last year by four of our Academy students and we desire to see many more of our students sign up this year for this powerful and life-changing opportunity. Our dear mentor, Mr. Brian Ritchey, assisted all of us with the Facebook sign-up so that we can all access our private Facebook page for ongoing program information and updates. Each of the mentors and volunteers then helped the students fill out their school information forms so that we have the most current information to support academic success for every one of our students this year. This is the year for outstanding academic performance and the students are off to a great start. They are embracing the importance of their total engagement in their own education and life goals. We were so excited to learn of the many ways the students are pursuing their best school year ever. One of our students is pursuing three honors courses as just one example. We ended the day with a bit of excitement when we exited the building. We learned that the street was blocked off by police due to the report of a suspicious package so we had to make last minute adjustments for our pick-up location. Everyone did a great job and we all left happy. Even the rain held off until we were on our way home. All I can say if that we are off to an outstanding start for our second year of FSGW Academy! Please accept my gratitude for all the assistance both in person and behind the scenes to make this day so lovely. I am grateful for each of you.